Claims to know, claims to do, claims to be, thought-thing realities, claims of powers or abilities, becoming or evolving, trying to know or do, rating people, pride or self-confidence. Claims to know are the beginning of all problems and errors. Without claims to know, ego cannot exits. Without claims to know, thinking errors cannot exists. Without claims to know, there are no thought-things. Knowing is the end of sensing. Knowing is the end of seeing. Knowing is the end of reasoning. To understand why knowing is impossible, please read We’re All Insane, Second Edition. Claims to do something follow claims to know something, because claims to do something require knowing what to do. Since human beings are a host for doing, to claim doing is to misunderstand and misrepresent human nature and human functioning. Hosting doing is a marvelous ability that should be regarded with the awe that it deserves. For a greater discussion on the problems inherent in claiming to do, please read Self: Who Am I? Claims to be something follow claims to do something, because claims to be something require claims of doing what they are desiring to be. Since humans are a host for thoughts and more, to claim to be a thought, image, or concept is to misunderstand and misrepresent human nature and human functioning. Humans should be proud of being hosts, not trying to become thoughts. Thought-things are thoughts that claim to be more than thoughts. The three previous errors are all thought-things. Thought-things are reified thought and reified thought is by definition always a thinking error. Reifying is when you regard humans thoughts as the realities that they can only partially describe, point to, recall, relate, report, or be about. Reifying is the process of creating thought-things. Each of the previous four thinking errors could not exist without claiming. Each error claims what is not true to be true. Each error claims as a way to exist. Humans are a wonderful creation that is beyond human knowing. Humans can be experienced but not known by other humans. All claiming is error. If there is any sin, then it is claiming. How can a host function as a host if it is claiming? Claiming denies hosting. Claiming is death of the host. Claiming is death of being. This is the error of pride in becoming good or better. No human has ever become better or good. Humans can perform behaviors better. Humans can with practice become good at a function, habit, or a behavior. But there is no evolving of human nature. Humans cannot make themselves become anything except through the lie of ego. If a human gives their identity to a self-image, then they have become that image instead of themselves. That is the only becoming that humans can do and that is death. Trying is insidious. 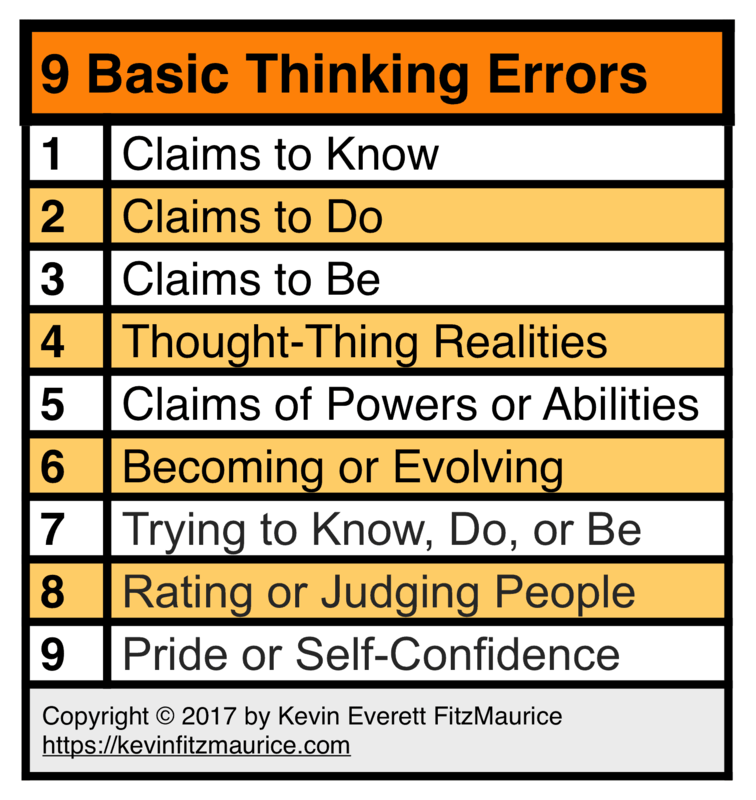 In order for a human to think that they are trying to know, do, or be something, they must first accept the previous six thinking errors as true. A host does not try to host. A host either hosts or it does not host. There is no trying for the human self. Trying exists only for ego. Human ratings are always a thinking error for they are reifying people as negative or positive knowledge. Human ratings are also known as self-ratings, other-ratings, self-esteem, self-images, self-concepts, and ego. 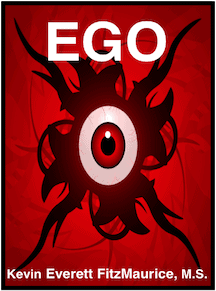 Ego ratings are possible, but they are dangerous because few are enlightened enough to keep ego ratings distinct from human ratings. You can demonize ego to good effect, but to demonize the self is to do great harm. The difference is seeing an ego as negative thought-things (uprooting) versus seeing a person as negative thought-things (murdering). This is the error of believing in yourself as cause or source. There is one source, God. There is one cause, God. This is the error of self-love, self-praise, and self-focus. For instance, this is the error of trusting and believing in yourself instead of God. Through pride, you hide the evil you serve. This is the goal of the self-esteem enthusiasts–cover evil with the mask of good. why dost thou glory, as if thou hadst not received it? I persistently practice preferring the positive. Complete discussion of these 9 thinking errors exists in Planet Earth: Insane Asylum for the Universe, Second Edition.